By Dr Anita Quye, Senior Lecturer in Conservation Science. Background info: European Researchers’ Night is an annual event funded by the European Commission that takes place in over 250 cities across Europe. #explorathon16 @ernScot. Explorathon 2016 was part of European Researchers Night where the contribution that research makes to all our lives was celebrated across the continent. 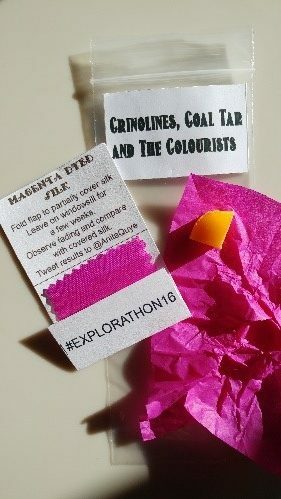 In my Explorathon event ‘Crinolines, Coal Tar and the Colourists’, connections between magenta-dyed silk, carbolic soap, a lump of coal and the University’s Archive and Special Collection became clearer in a tale of Victorian science, serendipity and stylish fashion. Based on my ‘Dye-versity’ research of textiles in 19th c. books for industrial dyers, a project funded by the Carnegie Trust for the Universities of Scotland, the audience came closer to the sights – and smells – of the so-called aniline, or coal tar, dyes. Revelations about the discovery and mass production of synthetic colours from the black waste of the Industrial Revolution were brought to life with clever animations by Lewis MacDonald from the School of Chemistry, courtesy of his three month Professional Internships for PhD Students from the Biotechnology and Biological Sciences Research Council (BBSRC). The audience were also treated to a visit to the Special Collection on the 12th floor of the Library to see some superb dyeing manuals dating from the 1850’s through to the 1890’s that I and my research team are studying, thanks to invaluable support from head archivists and librarians Sarah Hepworth, Roma Thompson, Clare Paterson and Lesley Richmond. It was great to reveal the colourful textiles inside the 19th century technical dyeing books for industrial dyers that are the focus of ‘Dye-versity’. Assisting in the show-and-tell were Julie Wertz, who has just completed her doctoral research of the University’s beautiful Turkey red textile archive, and Dr Jing Han, who found early synthetic dyes from the Qing dynasty in her doctoral studies of Chinese textiles by combining historical and analytical chemistry research. Anita in the University of Glasgow Special Collection showing dyeing manuals published in 1874 and 1882 with textile samples of early synthetic dyes © University of Glasgow Archives and Special Collection. Alongside a healthy dose of myth-busting about early synthetic dyes was a ‘goody bag’ for the audience to smell first-hand the pungency of coal tar in the form of carbolic soap. 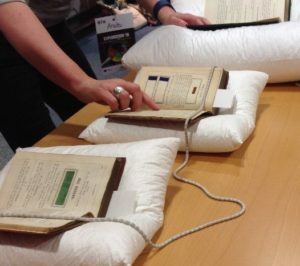 There was also a take-away citizen science experiment to see the effect that light can have on silk coloured with magenta, an early synthetic dye from 1859, for a serious message about the importance of textile conservation in historical colour preservation. I look forward to the results being tweeted to @AnitaQuye in a few weeks’ time, and thanks Jamie Gallagher and his team for organising Explorathon16 for another successful European Researchers Night by the University of Glasgow. 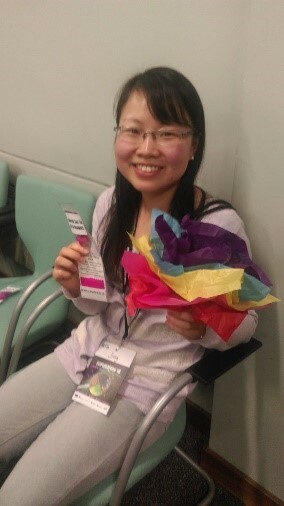 Jing with a colourful ‘posy’ wrapping around a lump of dirty black coal, the source of coal tar that provided the raw chemicals for early synthetic dyes © Julie Wertz, University of Glasgow. 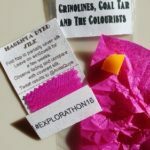 The audience ‘goody bag’ with a piece of coal tar soap and magenta-dyed silk for a take-home citizen science experiment © Anita Quye, University of Glasgow.